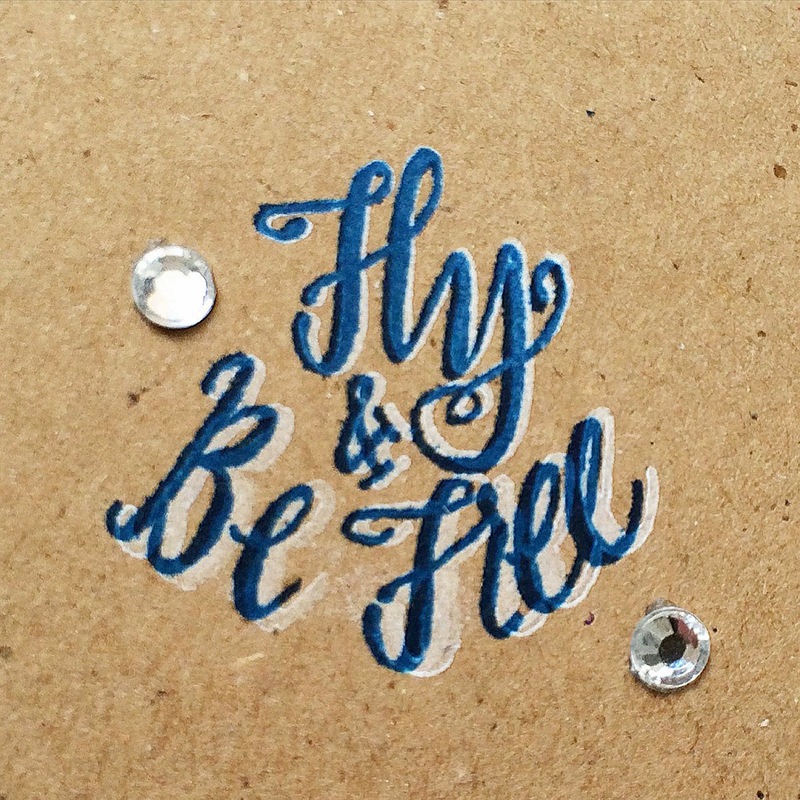 'Fly & Be Free' is one of the stamp phrases from the March kit that I've taken to heart this month. I used that sentiment on a couple of cards but, first, let's have a look at a layout about the ultimate escape where the mind can fly free: literature! My favorite genre is fantasy fiction, which stems from my obsession with classical fairy tales when I was a little girl. I could listen to Cinderella and Sleeping Beauty a thousand times in a row without tiring. I've still haven't had enough. As long as there are elves, dragons and princesses in the story, I'm in! LOL! 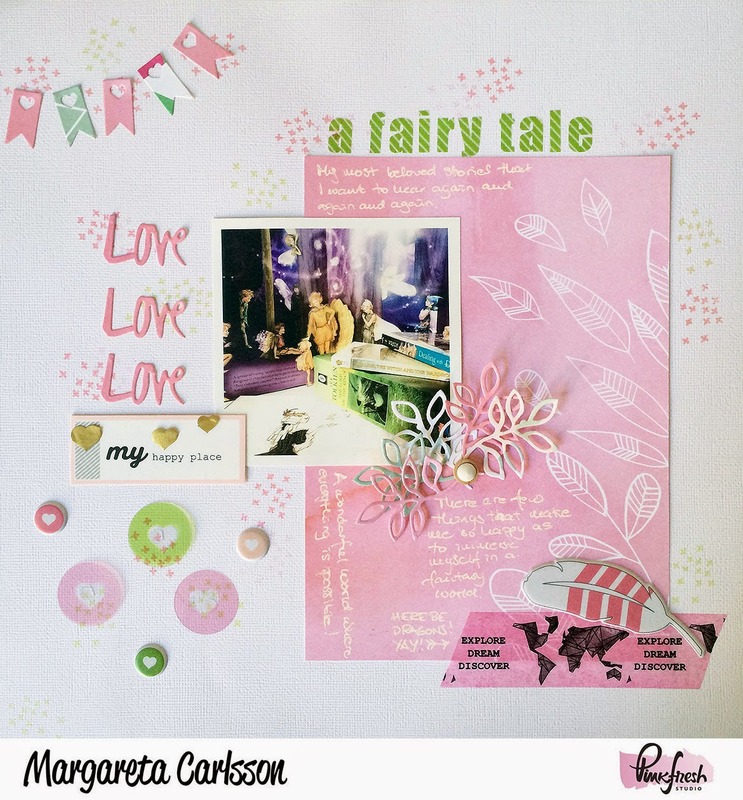 So, I documented a few of my favorite books on this page, using nothing but the March embellishment kit and a couple of pretty papers from the Up in the Clouds collection. In fact, I used a little something from every single item in the kit except for those pretty square sequins. Above is a detailed picture from the work in progress. I made good use of the craft dies. 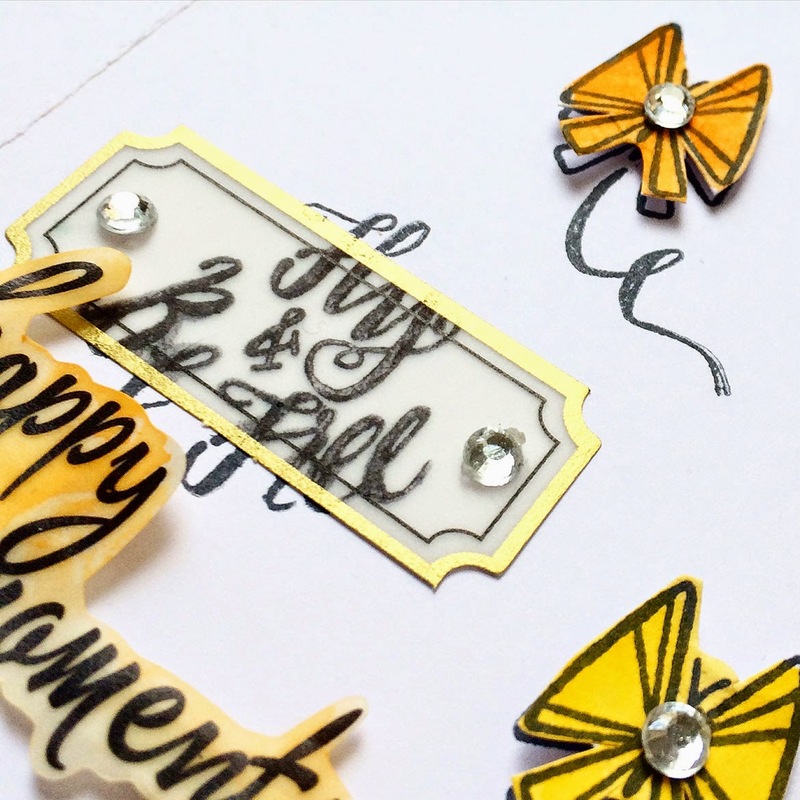 There are as many as 3 different craft dies in the March kit! I cut several branches of the leaves and layered them over the photo. The washi tape was colored with an ink pad (Studio Calico's Color Theory Flamingo ink) and I used one of the stamps in the set to embellish the white cardstock (Studio Calico's Color Theory Going Green and Blush Crush ink pads). The stamped pattern looks gorgeous behind the transparent acetate heart circles! After I took this little sneak peek photo, I also added some golden vellum hearts from the vellum shapes sheet to the thick cardstock label. 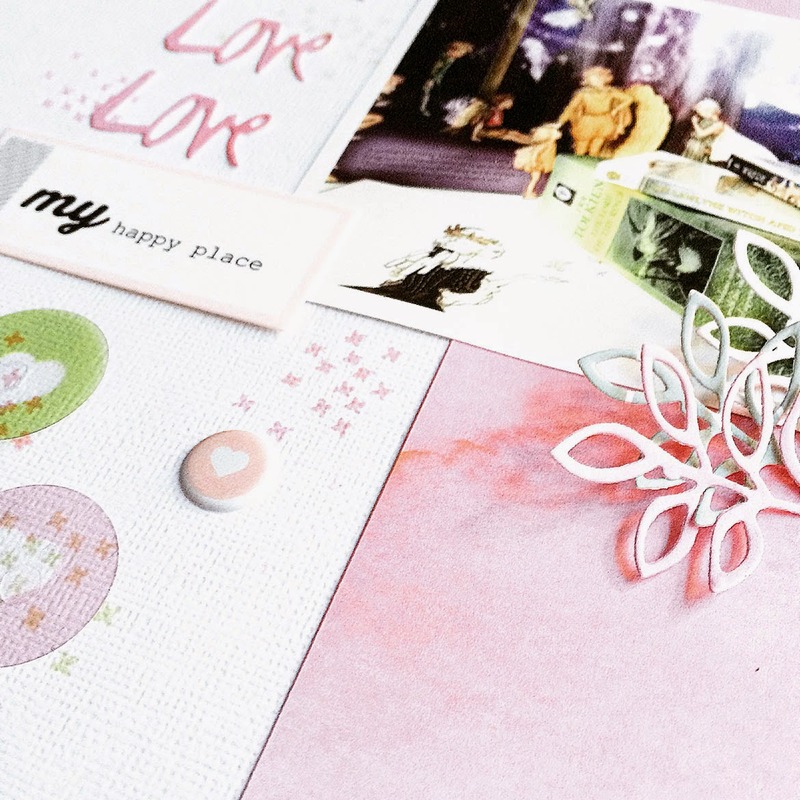 I love how the Pinkfresh kits are so perfect for cardmaking! And you can get many cards out of every kit. In fact, you could get an infinite number of cards if you only use the stamps and craft dies. And those items truly are the only thing you need, in addition to the cardstock and ink pads. 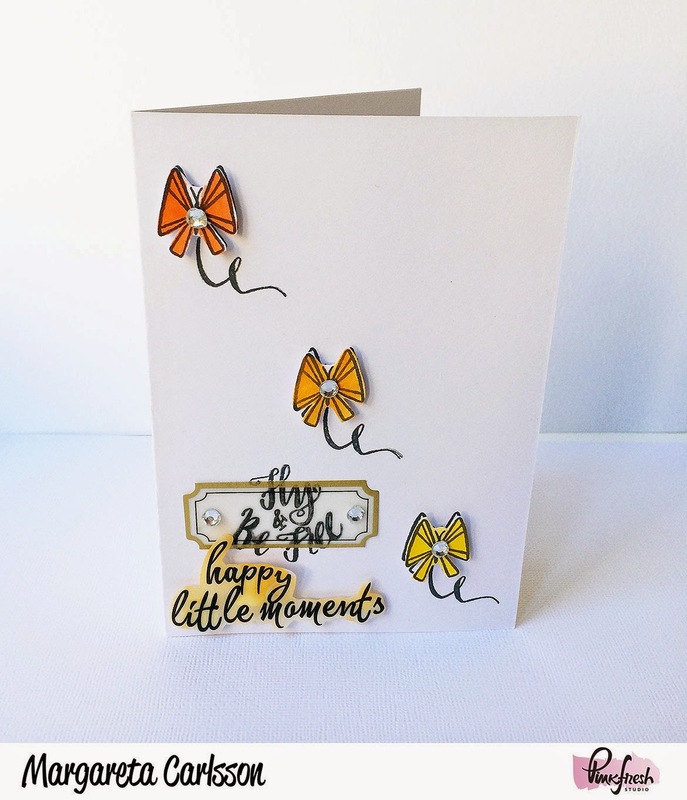 For the card above, I used nothing but stamping but I couldn't resist adding a little bling (you know, me and bling, LOL) from the February kit. Here's a fun tip for a kraft background (or for a black background). As you can see, I first stamped with a white ink (Hero Arts' Unicorn pigment ink) and then I stamped over that image with a color (Studio Calico Color Theory inks: Deja Blue, Emerald City, Poppy and Orange County). This 'double take' is adding dimension to the stamped image. Here's a similar card, but on white cardstock. I stamped the butterflies on a separate piece of cardstock, painted them with water colors (I swear by Winsor & Newton artists water colors), cut them out and put them on foam tabs over the original image, for dimension. Because I was working with water, I used Tsukineko Memento Tuxedo Black ink for the stamping. That ink is also working well on the vellum label, and the ink dried fairly quickly on the vellum. The 'happy little moments' vellum piece was colored with water colors. That was an experiment and I got a little worried when the vellum curled into tight roll, but as soon as it dried it went back to be fairly straight and flat again. I hope you are inspired to create and experiment with your own Pinkfresh kit. If you have any questions for me, just leave them here in the comments and I'll try to answer them. Happy spring!